Summary: Almost every couple faces a "now what?" moment as their last kid moves out of the house. There's a big empty nest looming over this new and uncertain stage in their lives. 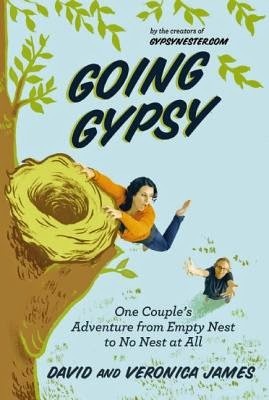 GOING GYPSY: ONE COUPLE'S ADVENTURE FROM EMPTY NEST TO NO NEST AT ALL by popular boomer travel bloggers David and Veronica James, otherwise known as the "Gypsy Nesters," was published a few weeks ago; and it sounds like quite a story! Imagine your kids have flown the coop and you and your husband are living in a big, empty, house. My husband and I would probably downsize, but the James did something else entirely. They quit their jobs and decided to travel America in a beat-up RV that found on (of all places) eBay. They tell their unusual story in GOING GYPSY giving readers the ups and downs they experienced in this next phase of their life! You can learn more about their travels on their popular website, GypsyNester.com. I think the book sounds fantastic and I'm happy to say that I have a copy to giveaway to one lucky reader. To enter, just fill out the form below before March 17th at 11:59 p.m. EST. I will randomly select and notify the winner the following day. This contest is open to those of you with U.S. addresses only. Good luck!